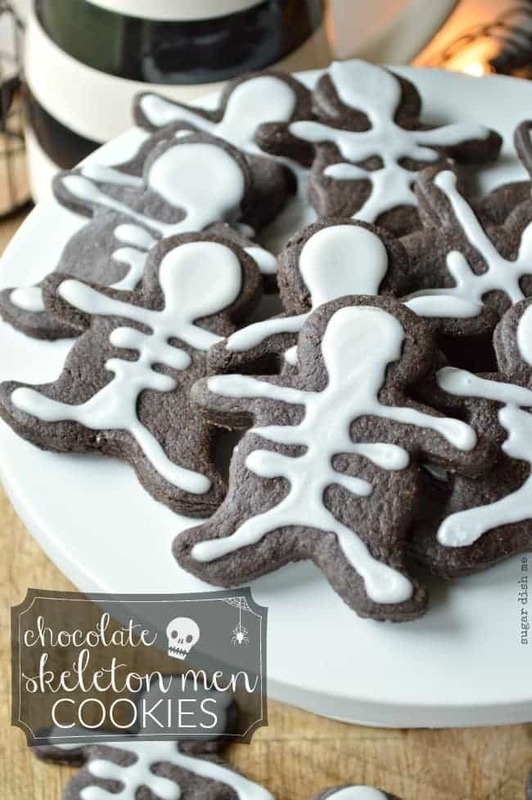 Little Chocolate Skeleton Men Cookies are a simple chocolate cut-out cookie recipe calling for your gingerbread man cookie cutters in October! 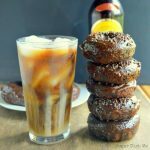 Note: This recipe goes all the way back to 2012! But I still make these cookies for my kids every year. 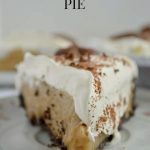 I’ve changed it a little over time, adding more salt to the dough (because salty chocolate is GOOD), and giving the option of adding espresso powder! It’s Friday!!! 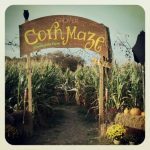 I am sooo ready to have another weekend filled with fall Halloween fun. Am I on your nerves yet with my Halloween excitement and fall things? Cause you are basically gonna need to get over that and have some Halloween cookies. Evan is begging me to send some to his school next week for the class Halloween party. Except the teacher hasn’t actually sent home any literature announcing a Halloween party. So I’m pretty sure Evan just wants me to keep the 4th grade in a steady supply of skeleton cookies. I’m cool with it. Because Halloween out here in Nowheresville is actually kind of strange. I was fortunate enough to grow up in the suburbs with like a zillion other children and our Halloweens were AWESOME. We always made our costumes out of stuff from around the house, and we always racked up with GOBS of candy. The protocol was to leave just before dark (because trick-or-treating in the daylight was for babies) and tear down the street full speed ahead. Getting allllllll the way down our street and back up the other side was a lot of walking and a lot of knocking and a LOT of candy. Everyone participated. Like if you didn’t put your light on and hand out candy you were the Scrooge of Halloween. Parents milled around in the street while kids stumbled through leaves and grass ignoring all the rules of polite society, EXCEPT saying ‘thank you’. Thank you’s were a must. My dad always stayed at the house to hand out the candy; he was really super tall and he had this Frankenstein mask… he was kind of the real deal. We always had THE BEST candy. My mom doesn’t play when it comes to chocolate. As the years have passed, this holiday has gotten seriously diluted and I think it’s pretty crummy. NO ONE turns their lights on. There aren’t many walkable neighborhoods out here. We located ONE, but it’s basically one gigantic safety violation with small children in costume running through the streets. No street lights, lots of traffic, the houses are kinda far apart, and again, not everyone participates. They also do this thing out here called Trunk-or-Treat. Do you guys have this where you live? I had never heard of it. The premise is for cars to line up in a parking lot and then decorate their trunks for Halloween. Then they hand out candy from there. You see it mostly at churches, and it’s actually really cute for little bitty kids (a clever solution to the no-neighborhood thing), but there’s no door knocking. No saying, “Trick-Or-Treat!!!!!! !,” at the top of your lungs. And no running through the dark with the crispy fall air flushing your cheeks. I need a Halloween revolution. Back to trick-or-treat basics. It starts with these cookies. Cream the butter and sugars in a large bowl. Beat in the egg, vanilla, and instant espresso powder. In another large bowl, whisk together the flour, cocoa, baking powder, and salt. Add the dry ingredients to the wet and beat until dough forms; it will take a few minutes. Form the dough into two balls or logs, wrap tightly with plastic wrap, and refrigerate for 1-2 hours. Pre-heat the oven to 375°F. Grease a baking sheet or line with parchment paper. Roll the dough out to ⅛″ and cut out using a “boy” gingerbread cookie cutter. Line them up on the prepared baking sheet and bake for 7-8 minutes (7 for a softer cookie, 8 for one that's more crisp). Let them cool for a minute or two on the cookie sheet before moving to a wire rack to cool completely. When the cookies have cooled, whisk together the powdered sugar and milk. Scrape the frosting into a quart-sized Ziploc bag, seal it, and cut a tiny corner off. 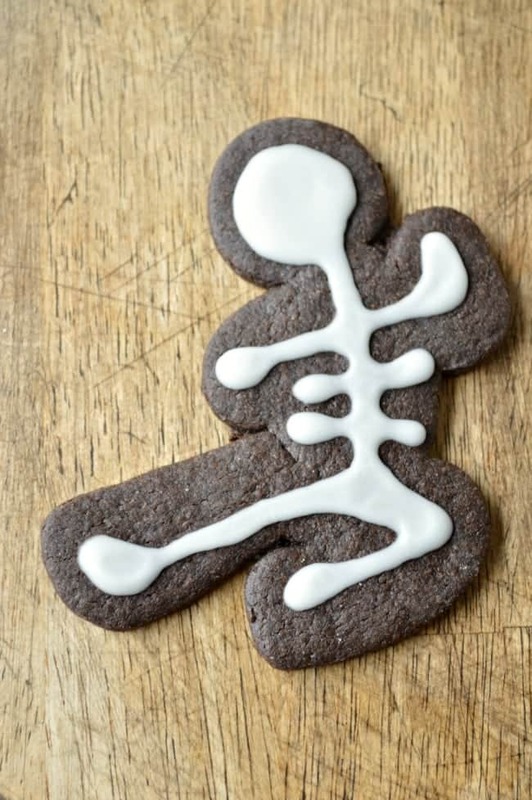 Use this to pipe the skeleton pattern onto your cookies. I always start with the head. Let the frosting set completely before storing. These are so cute! And I love that photo – I’ll have to hunt down some of the ones of our bin bag witch outfits from when I was little, it was a staple. Black bing bag. Plastice witch’s hat and spider webs, cats, whatever drawn all over our faces in eyeliner pencil. I loved Hallowe’en as a child – where my mum lives is a small cul de sac, but everyone knows everyone and all the kids still go round trick or treating at the other houses – I don’t think it’s quite the big thing it is over in america, but we had a great time and got lots of chocoalte nonetheless! I remember one year we had the insides of a pumpkin with us and my mum had told everyone before hand to say ‘trick’ when we went round and we thougt it was just hilarious telling people they had to put their hand in the pumpkin’s brains! It makes me sad that I don’t get any trick or treaters coming round here. We are going to use Monster Mash for our tidy up song in class this week though! Thanks! My sister had this photo stuffed in her archives and I snagged it. I think EVERYONE should post ridiculous old pictures of Halloween this week. Hurray for Monster Mash clean up song!! That is soooo cute. We had a cul de sac at the end of our street, too. What has happened to this holiday? It used to be so awesome. Now I’m scrounging for my kids to have awesomeness. I am determined!!! Waaaah I love these wee guys! We call it guising round these parts, and we make lanterns out of turnips. Have you ever tried to carve a turnip? It’s REALLY HARD. But we are a rugged people. My mum used to make our costumes – she is so talented, she didn’t just combine clothes that we already had in a clever way, she actually bought fabric and sewed stuff up from scratch. Really creative. Maybe I’ll dig out the photo of me in my flower costume, which I hated at the time beause my friend was the devil and that was much cooler, but looking back I can see how incredible it was and how much time my mum put into it. We also didn’t say trick or treat, but everyone had to ‘do a turn’ – sing a song or tell a joke usually. That doesn’t happen any more. I grudge children their Halloween sweets if they’re not going to work for them. Oh my gosh, me, too!! Nothing irritates me more on Halloween than some 13-year-old punk kids that couldn’t even bother with a wig or some face paint. They just show up in sweats looking all regular and think it’s a great opportunity for free candy. Gahhhh I hate that. They should be tricked before they are treated. My mom didn’t sew our costumes but she always helped us make them. One year she tied me up in a clear plastic garbage bag full of colored balloons, put my hair in pigtails with curly bows, and called me a bag of jelly beans. I LOVED it. She also wrapped my sister up like a present once. She was sooo cute and she hated every second. Oh! And she always let me paint my brothers and sisters faces. I love Halloween. And if it makes you feel better, we haven’t carved any turnips BUT! our pumpkin is like the hardest material on earth. Like it might be easier to carve a diamond. Photos next week! Yes. Yes you can. I have CHOCOLATE. Delicious! And it’s so cute! Thanks, Amanda! They were a hit. I think your kids are super lucky. 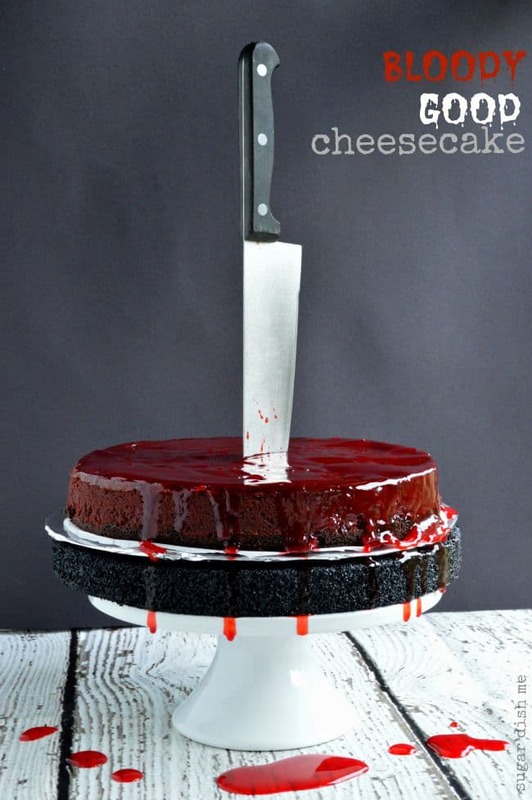 Not only are you a phenomenal baker/cook, but you have genuine enthusiasm for things like Halloween. I get through it. Barely. I wish I could say I have an interest in making it fun for Maya but I just don’t. I am missing a fun gene. It’s really sad!! That was really super extra nice. Thank. You. I really do enjoy stuff like Halloween, so all this doesn’t feel like an effort to me. I’d probably do a lot of this stuff even if I didn’t have kids. Maya will remember you were there and when she’s all grown up she’ll realize how cool her mom was for doing stuff she wasn’t really into. I love Reese’s!!! And they are awesome because Andrew hates them. No sharing. Except with Chad. I have to fight him for some peanut butter covered in chocolate. Don’t hate on my gypsy costume. It was an awesome excuse to wear too much of my mom’s makeup. Love the costumes! And the cookies look yummy, too! I can’t wait to try them out. Boo and Radley loved the cream cheese banana bread! Thanks!! 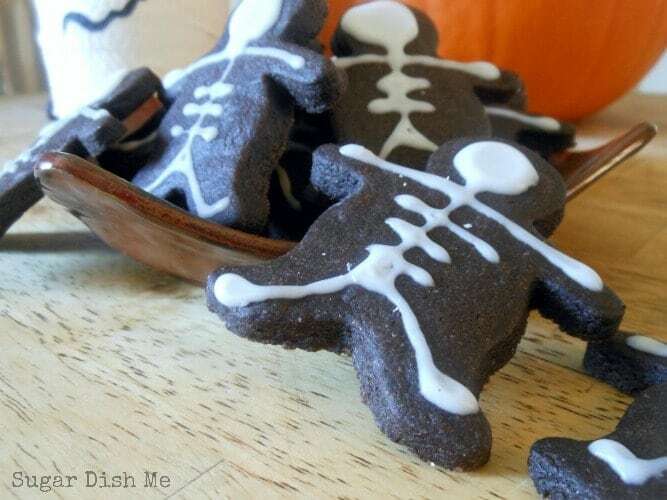 Boo & Radley will dig these cookies. 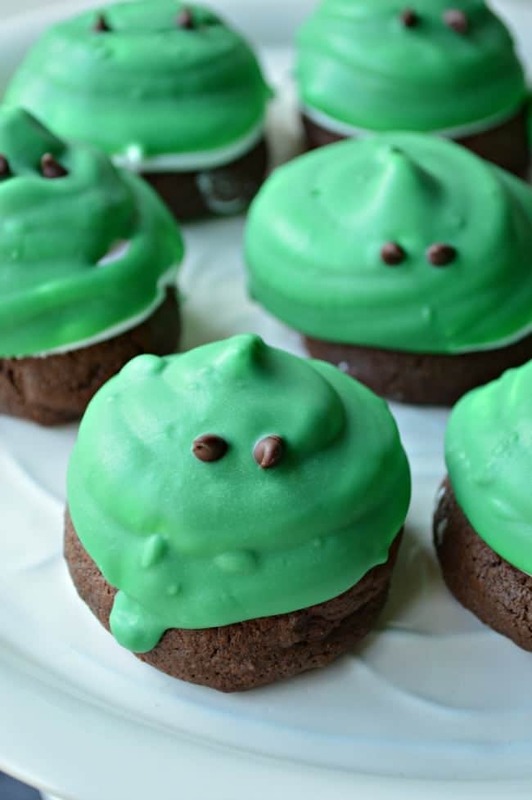 I saw something on Pinterest for how to make glow-in-the dark frosting which would make them infinitely more awesome. Glad the banana bread was a hit! It’s sad that Halloween isn’t as fun as it used to be. I know that my comment comes closer to Christmas, but still. These cookies are genius! I love how you have dressed them up. I also love that glass jar dressed as a ghost behind it! Those glass jars are super easy to make. I just save kitchen jars and then dip first aid gauze in an Elmer’s glue/water mixture. Then you wrap the jars, let ’em dry for a day, and decorate! Spooky mummies for nothin.Can’t take credit for the cookie idea, though. That was A taste of Home magazine. Your little guy would LOVE these! These cookies are too cute! 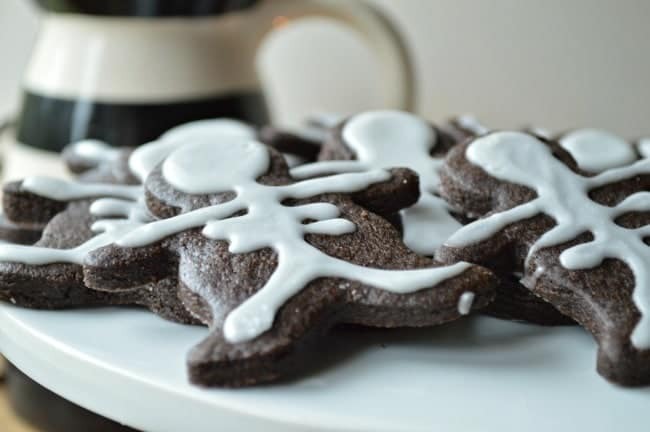 I love the idea of reusing gingerbread cookie cutters! These cookies are great! I bet my niece would LOVE THEM! They taste good, too! 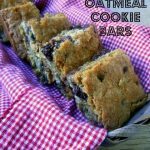 This recipe makes a lot of cookies – great for kiddos!